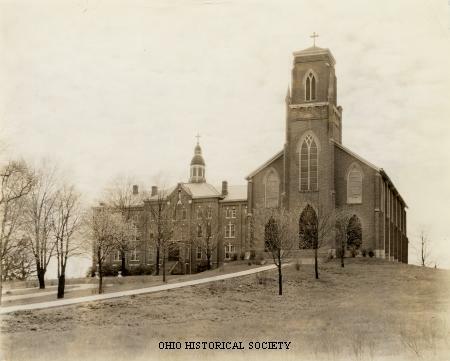 This image depicts the first Catholic Church in Ohio, St. Joseph Catholic Church in Somerset, Ohio. The church was established in in 1818 and the first church building was log. A second church was built of stone in 1821 to accommodate the growing congregation. In 1843 the third church building was blessed on St Dominic's day. This building, made of brick, was placed on the National Register of Historic Places in 1986. Ohio Historical Society. State Archives Series 1039 AV; Box 5, Folder 2, AL06172 from the Works Progress Administration, Ohio Guide Photographs Collection.